Starting with the turn signal lamps in question, this pair of LED turn signal lamps are a massive upgrade from the stock turn signal lights; they are brighter and bigger. They serve as turn signal lights as well as parking/clearance lights and come in either clear or smoked lens, depending on what you prefer. Lastly, these are direct replacements and come with resistors so you won’t get error messages or get hyper flashing. Daytime running lights increase your G-Class’s visibility during daytime conditions and automatically switch on when moving forward. This can be a vital function when driving uphill to a private community or up mountains. 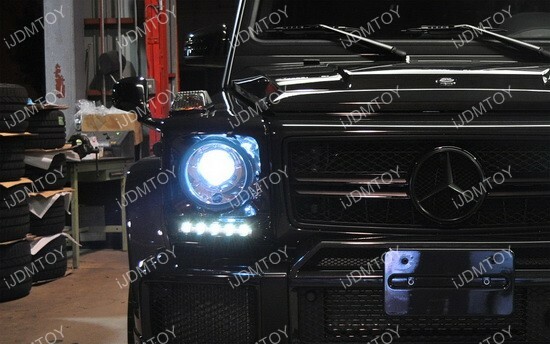 The brabus style daytime running lights can also be a source of flair; the kit comes with an unpainted frame so you can color it however you want and the 5-LED design looks pretty cool too. Rear visibility is vital in letting drivers behind you know when to brake. 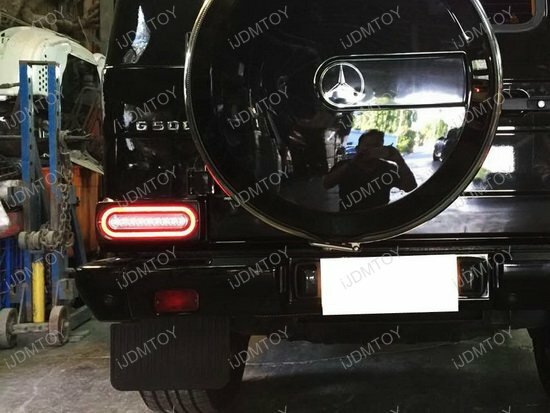 While stock tail lights do the job, this full LED tail light is a full continuous LED tail light assembly with LED turn signal cluster so you get a more even distribution of light and overall a better look while it also serves as brake lamps. 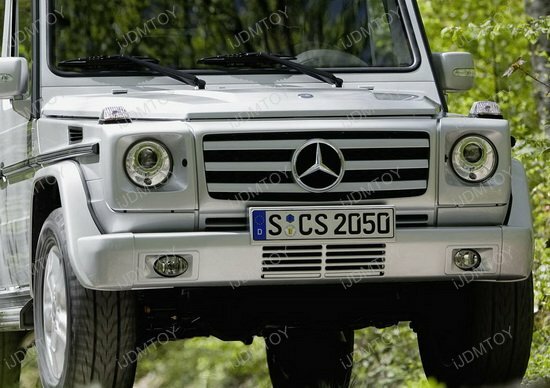 Additionally, Mercedes have neglected the G-Class’s rear lighting upgrades for the older models. Adding this turn signal/tail lights will give it the enhancement it needs. The full LED turn signal/tail light comes in smoked or red lens and comes with resistors so you won’t get error messages or experience hyper flashing. Side marker lights are necessary for other drivers to see you in oblique or diagonal angles. 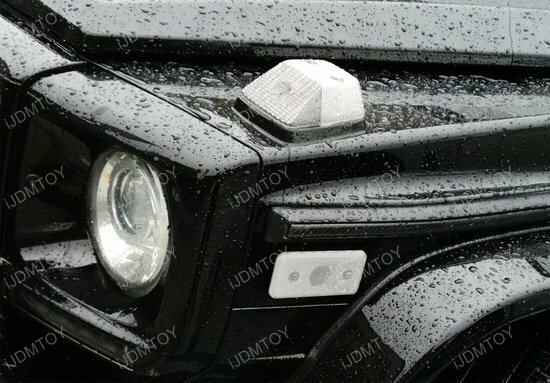 These LED side marker lights give a surprising amount of visibility despite its small size and subtly upgrades the style of your G-Class. Lastly, the Winjet fog light lamps with H11 bulbs increases and adds to the light outputted by your headlights and cuts through fog so you can see what’s up ahead beyond what your headlights show. 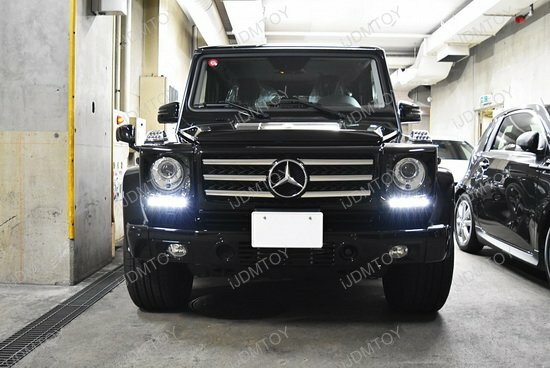 This set fits not only the 2002-2009 Mercedes G-Class for halogen headlight trim, but also a variety of other Mercedes models. 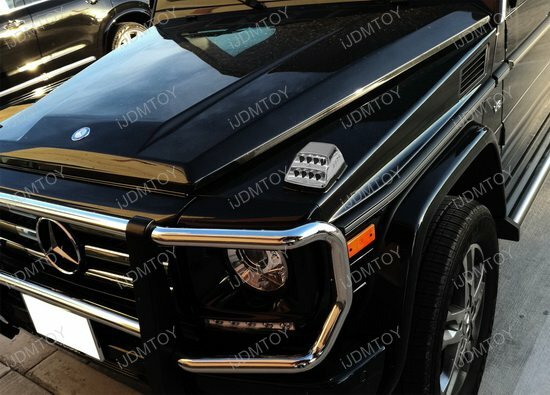 This entry was posted in - LED & HID Updates and tagged Car LED, DRL, H11 LED Fog Lights, iJDMTOY, LED Daytime Running Lights, LED parking lights, Mercedes, Mercedes LED Sidemarker lights, Mercedes LED turn signal lights by Jason T. Bookmark the permalink.